Sachin Tendulkar Plays at Eden Gardens, Kolkatta.... What is 199 !!! Do numbers have any attraction…………….. ‘199’ seems to have gained so much of attraction suddenly…………….. it is a test match at Eden Gardens –everywhere you see this 199….. At Eden Gardens today, Rohit Sharma fresh from the euphoria of a double ton in ODI got his Test cap from Sachin, after having played 108 ODIs – getting the nod over Ajinkya Rahana. Alongside also debuted Mohammed Shami preferred over Ishant..
~ no point in trying to attach some more values ….. the badshah of Cricket – Sachin Tendulkar has decided to retire – the swansong will be at Wankhede and this one at Eden Gardens, Kolkatta – the penultimate is his 199th Test……. He has been a marketing icon – a premium product and Commercials are trying to exploit this number and mint more money……. ~ those of us who have been on a Cricketing ground in India live would vouch for his specialty ……. ‘crowds would go nuts’ cheering him ~ sound of Sachin, Sachin…. Saachhin, saachin would rant the air – getting louder everytime – he is involved, not necessarily when batting – a shot towards fielded by Sachin would draw strong sounds………….. more so, if he were to chase and stop … and take a catch – Sachin, the fielder and bowler would exhibit more glee when a wicket is fallen ………….. and crowds would cheer more, the moment the replay is shown on the big screen….. the ecstasy would know no bounds when he would turn and wave towards the crowd. Sachin has been ever obliging ~ once it was reported that Sachin was signing autographs after a gruelling match - someone suggested that he was tired – but Sachin reportedly said, he would never disappoint his fan and would ensure that they are happy…. Today, Sachin is playing his 199th test and the team composition is such that the rest of 10 have aggregate of 198 Tests…. Could have changed had Ishant Sharma been playing this Test… !!! Though I do not approve of this [does anybody really care ?] – one of his followers from Burdwan has found a unique way to pay his tribute to the master. Sunit Chakroborty from Burdwan district is set to drive his car on reverse gear from Durgapur to Eden Gardens in Kolkata -- about 199 km in distance! Chakroborty says this is his way of showing his gratitude to the god of cricket. He already holds a record in reverse gear driving and met Tendulkar in Mumbai in 2011. He will go to Eden Gardens via Burdwan, Hooghly and Howrah districts. His car was flagged off on Tuesday by cheering Sachin fans. It is reported that on Monday, lensmen and TV crews converged in front of the home dressing room at Eden Gardens. A life-size wax figure of Sachin Tendulkar had become the center of attention. Susanta Ray, a sculptor from Asansol, was waiting sheepishly to present it to his hero. 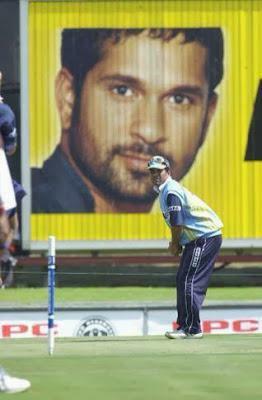 The photographers wanted the real Tendulkar to come out and stand by the side of his replica. He had just finished a two-hour net session and was keen to leave for his hotel. Still he retained his smile, had a brief chat with Ray, waved to everyone, and left amid loud cheers. It is very high ~ but the media frenzy has never been new to the Little Master…….now it may not be emotions but commercial hype surrounding this 199. West Bengal sports minister Madan Mitra described this as giving a “fitting send off to a legend, Kolkata style.” ~ but ~ there is also a report that the legend’s name was misspelt as ‘Sachine’ on some placards which was pointed out by Dhoni in his Press briefing. Whatever it be – Kolkatta reports that Sachin fever has gripped the city – with some drawing reference to coincidence of the day of Lord Rama having returned to Ayodhya. As Tendulkar walked into the Eden Gardens on Monday, around 100 kids wearing Tshirts with Tendulkar's picture on them gave him a rousing reception. On entering the venue, a wax statue of Tendulkar raising his bat after scoring his 100th hundred in Dhaka last year greeted him. CAB treasurer Biswarup Dey said Tendulkar's friend and contemporary batting great Brian Lara is set to grace the match. On Deepavali day, India worked desperately hard to defend 383 against Australia in Bangalore~ now they are on a different wicket ~ somehow more than the match, the concentration and focus seems to be on Sachin and 199………. It is incredible way that the little master has scored runs and more incredible is the way, he has managed a lot that happened around him. His love of the game stood out above all, he’s been able to maintain that balance,” – he has been through rough troughs also – he has captained and later has played under many juniors, always giving his 100% ~ and that is the quintessence of the Man most loved in Indian Cricket. if revealed sure would put the credits for the same.